Is it always Grey in London? Our most recent projects in London (which are available to see in our Portfolio Section) all have an injection of colour. Hopefully you will agree that we have found the perfect balance where the colour brings some fun and life to the space, whilst not infringing on the stylishness and tranquility of the space. 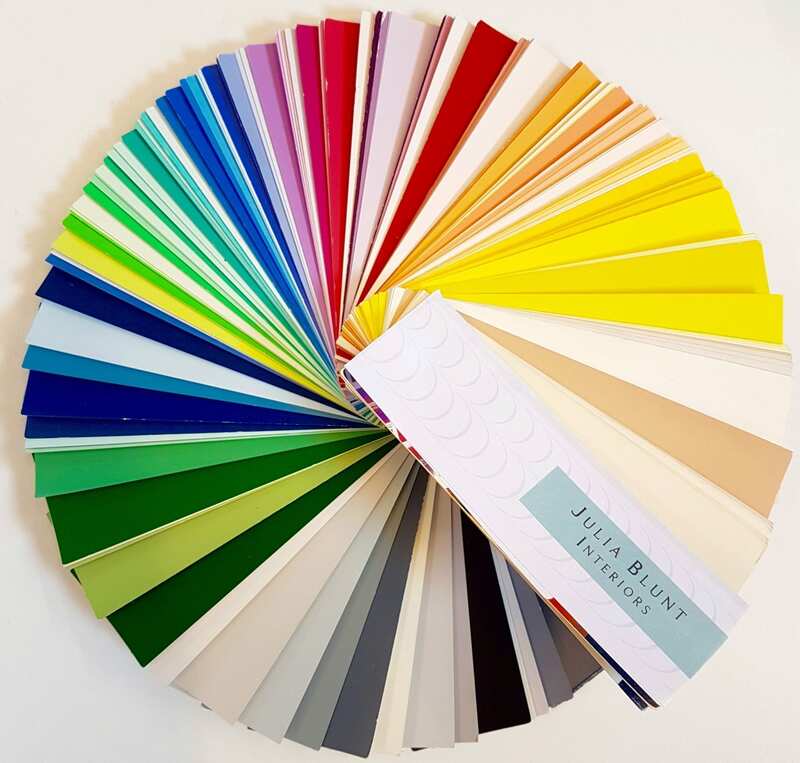 Some of our clients have come to us already with a passion for colour, whilst others understandably err on the side of caution with a simpler more neutral palette. If you do fall into the latter category (which a lot of people do), what we often recommend is to have a neutral base (ie: sofas, walls, etc..) and to then accessorise with items which are a bit more daring. After all, if after five years you feel like a re-vamp – it will be easier to change a few cushions as opposed to a whole sofa. 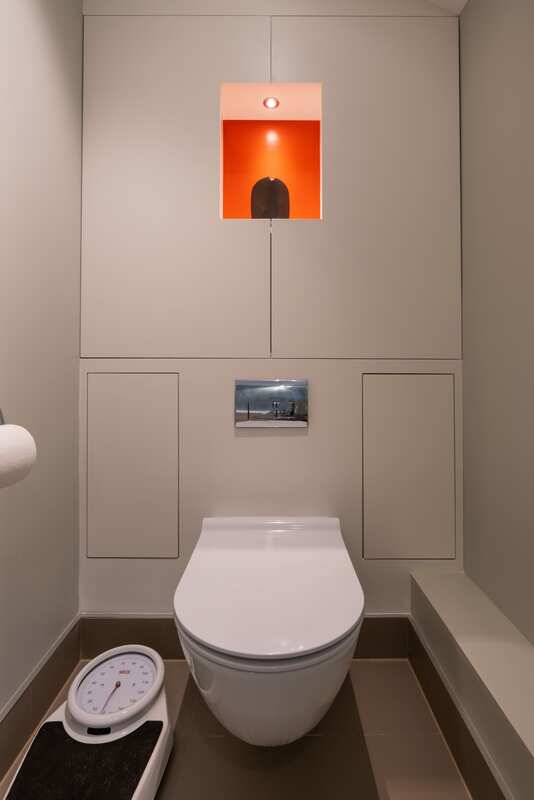 Another little trick which worked rather well (as seen in images from our Marylebone Mews House project), was to have a ‘hidden cupboard’, which looks like a wall with a small central recess in it. The cupboard exteriors match the pale walls, but the recess offers an insight into the lovely warm orange of the interior. 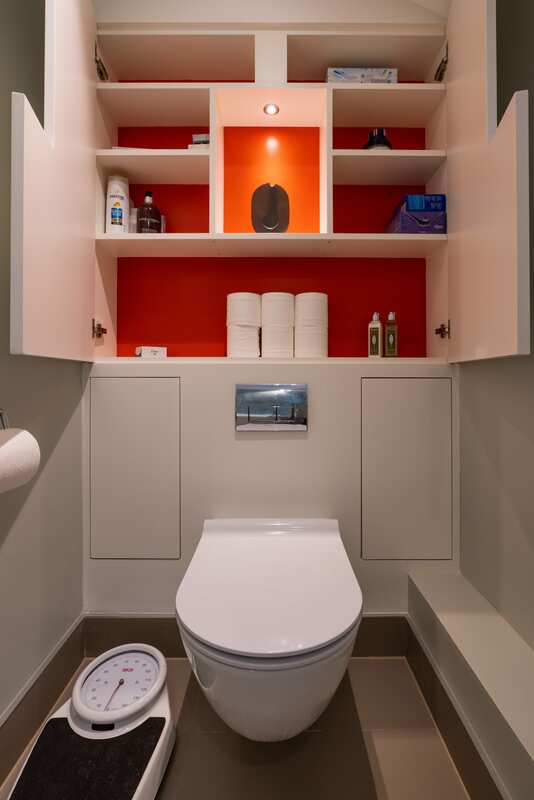 A seemingly small injection of colour becomes a unique feature that renders the bathroom original in its style and character. Although Julia Blunt Interiors is based in Wiltshire, we very much relish the opportunity to work in London as well as in the surrounding counties as we enjoy the variation in styles that this brings. So a big thumbs up to colour from us – especially in London. After all – what better way to escape a grey and gloomy day spent in the concrete jungle that is London, than to come home to a space that makes you smile, and brings a little bit of colour back into your life.